Offering you a complete choice of products which include compression testing machine ctm and compression testing machine. We are offering the high-quality collection of Portable Compression Testing Machine to our valuable customers. Our offered products are made with following set industry standards under the direction of experts. Besides, these are used to test metals and material such as refractory bricks, rock samples moving props, and rubber parts. 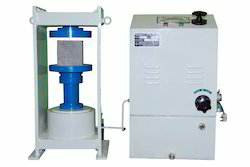 We are offering a wide assortment of Compression Testing Machine. To test metals and material such as refractory bricks, rock samples moving props, rubber parts etc. Continuous roll autographic recorder supplied as standard to enable study of the behavior of material. Our compression Testing machine is closely controlled for sensitivity accuracy and calibration during production. Every machine then calibrated over each of its measuring ranges in accordance with the procedure laid down in British standards 1610-1964 IS 1828-1975.